Caught a huge bass with bacon. My family took a cruise out of Miami. The night before we left we stayed at this nice hotel in Doral. We spent the day swimming in the pool, playing billiards/ping pong/corn hole, and just enjoying each other's company. We saw a few signs by the lake outside our hotel that our hotel rents out fishing gear. We also saw signs that there were alligators and poisonous snakes in the lake. We saw a water moccasin but decided to fish anyways. It's catch and release and we decided to try our luck. They gave us fishing poles so bad you can't even cast, and chicken meat from the kitchen as bait. No luck. We found a worm on the ground, hooked it on, and threw the string into the lake. We immediate pulled in a blue gill that puts the Washington (where I live) blue gill to shame. We were hooked (no pun intended). My uncle drove to a Wal-Mart close by for worms. They had run out. He grabbed a pack of bacon. When he got back we through in a few pieces of bacon to see if they liked it and they did. Problem is it attracted turtles (including snapping turtles) to our area. We were popular. I hooked some bacon on the line and tossed it in. I snagged some sort of little fish and we saw this massive bass start chasing it. Live bait, baby! It took a few tries but I finally hooked the sucker below. I didn't get a measurement but we're guessing it was around 5 lbs or so. It was a rush, for sure! Also, nice fish! But also, poor bacon. Why add bacon if your bass already has some? Serendipity. 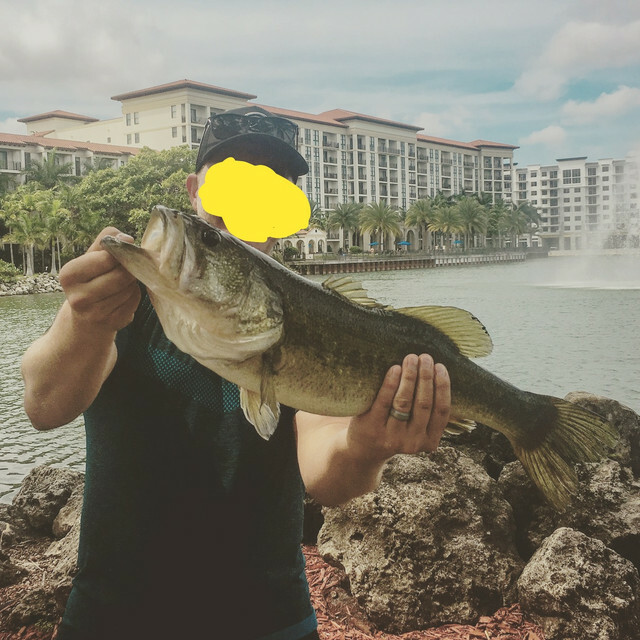 RE: Caught a huge bass with bacon. I caught an even bigger fish at that same place. Is that mustard all over your face? Did you ask the hotel kitchen to cook it up for you?